Disque 0 o 9 para tono de discado (línea externa). How can I pick up a line? Buenas tardes, bienvenido a OM Personal, habla Dan, ¿En qué puedo ayudarle? Good afternoon, welcome to OM Personal, this is Dan speaking. May I help you? Can I ask who's calling? Yes, Mrs Denis, if you could hold the line one moment, I'll put you through to Mr Moore. if Mr Moore is available to take your call right now. Sr. Moore, la Sra. Denis se encuentra en línea 1 por un curso multimedia para su empresa. Tiene algunas consultas para hacerle. ¿Puede hablar con ella? Gracias. Mr Moore, Mrs Denis is on line 1, regarding a multimedia course for her company. She has a few queries about it. Would you be able to speak with her? Thanks. Sra. Denis, lamentablemente el Sr. Moore ha salido de la oficina por media hora. Si me deja su número de teléfono, la comunicaremos con el Sr. Moore apenas regrese. Mrs Denis, I'm sorry but Mr Moore is out of the office for half an hour. If you'd like to leave your number, I'll have Mr Moore call you as soon as he returns to the office. Sra. Denis, ¿podría decirme por qué asunto llama? Mrs Denis, could I ask what the matter was regarding? Sra. Denis, ¿podría decirme cuál es el motivo de su llamada? Mrs Denis, may I tell Mr Moore what it is in relation to? ¿Quiere dejar un mensaje, Sra. Denis? Can I take a message, Mrs Denis? ¿Va a dejar un mensaje, Sra. Denis? Would you like to leave a message, Mrs Denis? ¿Podría decirle que lo llamé? lo llamó la Sra. Denis? Gracias por su llamada, Sra. Denis. Hola, habla Dan de OM Personal de parte del Sr. Moore. ¿Se encuentra la Sra. Denis para hablar con él? Hello, it's Dan from OM Personal calling on behalf of Mr Moore. Would Mrs Denis be available to speak with him? Hola, habla Dan de OM Personal de parte del Sr. Moore. ¿Podría comunicarle a la Sra. Denis que llame al Sr. Moore cuando le sea posible? Su teléfono es 4759 3636. Gracias. Adios. 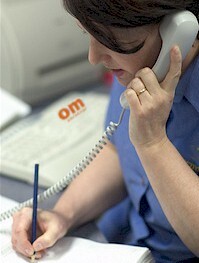 Hello, it's Dan from OM Personal calling on behalf of Mr Moore. Could I leave a message for Mrs Denis to call Mr Moore when it's convenient. His phone number is 4759 3636. Thank you. Bye. Lo siento, Sra. Denis. El Sr. Moore se encuentra en una reunión hasta las 4 y media de la tarde. La comunicaremos con él apenas se desocupe. I'm sorry, Mrs Denis. Mr Moore is in a meeting until 4:30 this afternoon. I'll have him return your call as soon as he's free. Lo siento, Sra. Denis. El Sr. Moore no se encuentra en la ciudad hasta el jueves de la semana próxima. ¿Puede esperar hasta que regrese? Si es urgente, le enviaré un mensaje. I'm sorry, Mrs Denis, Mr Moore is out of town until Thursday next week. Can the matter wait until his return, or if not, I could get a message to him if it's urgent?